©Bert Gildart: There is no place in North America where the tides are greater than in Fundy Bay. In fact, there is no place in the world where they are greater. The condition, of course, creates uncertainty, particularly among visiting kayakers who are bound to hear rumors. 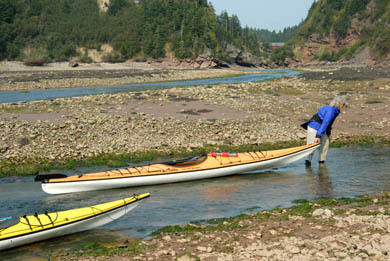 One man, in fact, told us that we would be placing our lives in great peril if we attempted to kayak Fundy Bay. 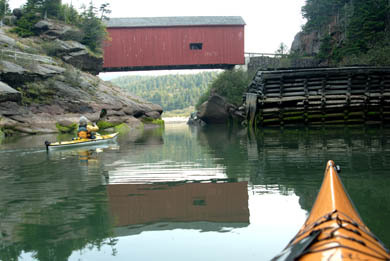 That was from a man who lived in the interior of Nova Scotia, and unfortunately, he was one of the first we met, and his advice made an impact on Janie who was dead set against kayaking in Fundy Bay. For awhile, she had me convinced, but then truth inserted itself in her, and we stumbled across the Fresh Air Kayak Service. Fortunately, proprietor Alan Moore was there and we listened to him say that his trips are suitable for entire families and that on several occasions they’ve taken out children as young as two. Nevertheless, we decided to give it a try, and launched our kayaks from the Point Wolfe covered bridged, a launch point Alan recommended, but only under appropriate circumstances. Before the day was over high and dry is an expression Janie and I came to understand—the hard way. As instructed, we launched at high tide—or at the time of day when the Bay of Fundy so exerted its force that beneath the Wolfe River Covered Bridge the river’s flow seemed to be stopped. Here, the tide’s power had created a small lake that made launching a cinch, and we easily floated above the rocks we had seen completely exposed several days ago when we hiked along the tidal flat just a few hundred yards downstream. Water, in fact, so completely covered this mile-wide flat that historically the flat was was used by loggers and shipwrights who took advantage of the tides. When the tide was up, loggers would help crew members load a cargo of red spruce aboard for transportation to nearby building yards. But today, all we cared about was whether the water was high enough to provide access to the Bay of Fundy, which it was. We kayaked for about an hour, and just when we hoped for a break, before us was a sandy beach we learned was called Secret Beach. Indeed it was recessed, and at one end it was guarded by large boulders which supported an inter tidal community of kelp. Their long strands of green color made us think of forest creatures such as gnomes and hobbits who had temporarily taken leave of the forest. At the other end of the beach was a series of arches cut by countless millennium of Fundy tides. 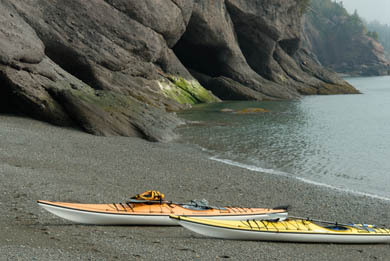 We ate lunch at Secret Bay and then continued our paddle, passing Squaws Cap, Porpoise Cove, and Mathews Head. Finally, we came to Hunt’s Hole, and realized that, here, we probably needed to make a decision. Alan had said he had might have end-of-the-season clients, and if so, he’d shuttle us back to our truck, if we crossed paths. Because we had not yet crossed paths, we decided to return to our truck by sea. The alternative would have been to try and hitch a ride late in the day, when the roads in Fundy Park receive but scant use. Alan had cautioned us about the afternoon winds, saying that at this time of day they’re usually from the west and that they can not only be difficult to buck, but that they can create large waves. We discovered, as Janie now likes to recall, that Alan was right on both accounts! For well over an hour we bucked large waves and a head wind—and perhaps that’s all that needs to be said about that. And then we left the Bay of Fundy and entered what hours earlier had been an area large enough to load huge ships with large quantities of timber, but which at 3 p.m. no longer held any water. Alan had also cautioned us about the dramatic nature of the area’s low tides and how low they can dip under normal circumstances. These tides exceeded those conditions, for these were no neap tides, created when the sun, moon and earth all align themselves to create exceptionally low tides. Perhaps, that’s all that needs to be said about that, other than the fact the rocks are covered with a delightfully slick moss that makes walking treacherous, but renders them kayak friendly, something you should always remember should you ever want to pull kayaks almost a mile back to your vehicle. 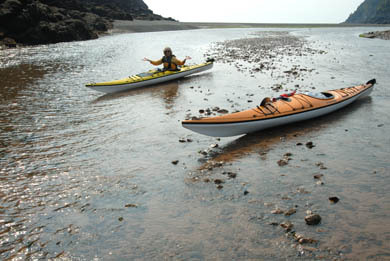 In reality, we knew that we might have a bit of rough going, but both agreed the next day after hot showers, that if you want to experience the drama of tides in Bay of Fundy, there is no better way to do so than to kayak through them. This entry was posted on Monday, September 18th, 2006 at 12:18 pm and is filed under Natural History/Conservation, Travel. You can follow any responses to this entry through the RSS 2.0 feed. You can leave a response, or trackback from your own site. Bert and Mom–I am laughing thinking that I know the exact tone of voice that mom is using to say—”don’t you listen to anyone Bert?” I wish I could take the kids and follow you in your adventures—-they miss you dearly. Kisses and hugs all around—we are thinking of you daily and waiting for the next…. Hey guys, I think you had a big win there. After all, you managed to get in some kayaking AND a 1-mile hike, all in one package! Sounds like good fun. Hi Bert, interesting experience on the Bay of Fundy. It is a unique paddling destination! If you ever come up this way again, try getting over to the other side of the Bay in Nova Scotia where you will find the most phenomenal effects from the huge tides at Cape Chignecto. Cape Chignecto Park might interest you for a trip actually, incredible wilderness hikes! If you check out our site above you will see what I mean.